Let’s face it. Few things out there pair more naturally together than whiskey and camping. 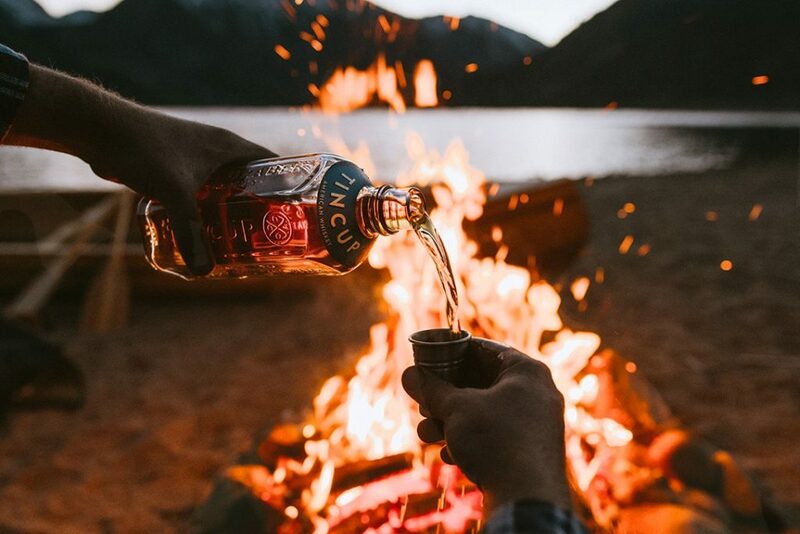 Whether it be a little extra kick in the morning coffee (no judgments of course) or a fine nightcap by the fire after a long day on the trail, there’s something about whiskey that just feels so innate to the whole camping experience. Living off the land, spending time in the outdoors, purposefully neglecting your emails. All of this exudes Americana at its finest – as does a cup of whiskey to top it all off. It’s here that we pulled from our own experiences to conjure up a list of the best camping whiskey around. what camping is all about. A classic. No matter how you slice it, Buffalo Trace will always be an essential whiskey for not only the campsite but for the home bar, workspace, and barbecue. It’s because, with not only a storied history but a balanced and smooth flavor profile, this is one non-discriminatory spirit that’s American through and through. And we can’t ignore that. Prominent notes include those of brown sugar, toffee, oak, cinnamon and caramel so there’s obviously something special hidden in each iconic bottle. Straight from Chicago, Few may only have limited quantities of their White Dog whiskey for the taking but if you’re looking to get wild in the wilderness we definitely suggest you try to pick up a bottle of this moonshine-tribute spirit. Each sip boasts a clean and crisp palate experience thanks to its unaged nature. Yes, that means this whiskey is bottled before it hits the barrel. If, however, white lightning is a little too much, this whiskey also serves as a great base for some campsite cocktails. No doubt about it, if you can survive Prohibition, The Great Depression, Two World Wars and 40 years of exile from the US only to continue producing award-winning whiskey years later odds are you’re onto something special. 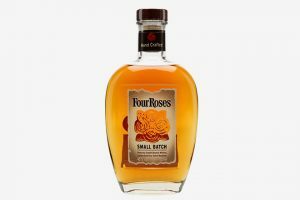 And that’s exactly what Four Roses has going for it. Which is why their Small Batch is a perfect campsite addition for the weekend. It’s smooth, affordable, and oh-so balanced with a blend of mellow spices, rich fruit, sweet oak and caramel to round things out. 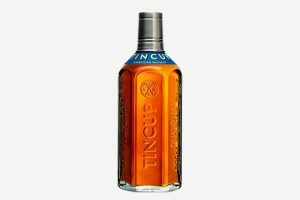 Distilled in the Rocky Mountains as mountain whiskey, it was impossible for us not to include Tin Cup in this roundup. It’s not just their backstory that intrigued us either. In fact, Tin Cup is a damn fine spirit for outdoorsy folks looking to loosen up under the stars after a long day. 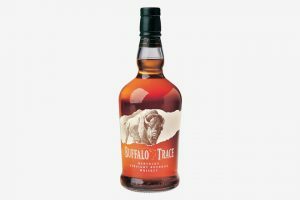 Here, we have classic American whiskey, thanks in part to its bourbon-style profile complete with a bold and spicy finish. Additionally, each batch is cut to proof with fresh Rocky Mountain water. And while the Kentucky purists might disagree, that’s one fine way to finish a whiskey if you ask us. Every spring the San Francisco World Spirits Competition is held to commemorate distilleries on a grand scale. 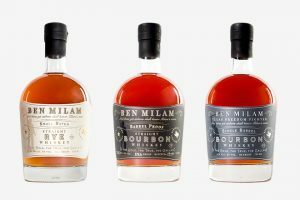 And when it comes to some of the best whiskey, Ben Milam distillery from Blanco, Texas has won double gold for their bourbon two years in a row. 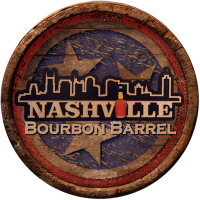 They’re new to the scene which is even more intriguing, and also offer a single barrel bourbon and straight rye as well for good measure. We’re all familiar with High West – the Park City, Utah distillery that truly embraces that age-old frontier lifestyle. 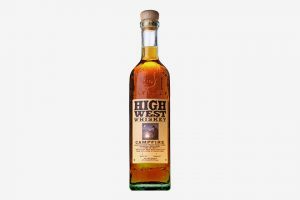 Well, fortunately for us the renowned distillers at High West decided to embrace that campfire aesthetic as well with their aptly-named Campfire Whiskey. The difference? How about the world’s only blend of Scotch, bourbon and rye whiskeys between 5-8 years old. The result is a well-balanced spirit with just the right amount of gentle smoke on the palate to complement those burning embers at your feet. One-of-a-kind that’s for sure. With new distilleries popping up all over the American West, it’s clear whiskey is no longer a southern staple. And that’s not a bad thing at all. Just take this award-winning Colorado Rye for example. 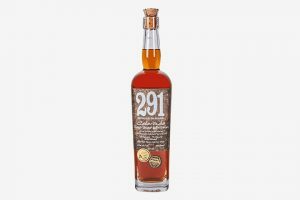 This uncut version of their flagship bourbon is no joke – clocking in at approximately 127 proof – but with a surprisingly smooth character. Each batch is also aged in American white oak barrels and finished in charred aspen staves for good measure. Definitely a way to loosen up the bunch in true American fashion. 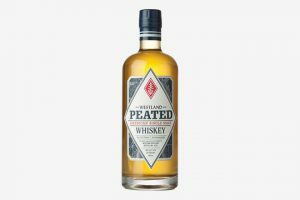 Interesting in both its production and flavor profile, Westland’s Peated American Whiskey is a unique variation of their house style spirit made from a mash of peated malt. The whiskey is then combined with a variety of malt-focused spirits to help balance everything out accordingly but results in a wide spectrum of flavors and smoke you simply won’t find anywhere else on the market. We’re talking notes of nuttiness combined with smoldering moss, flamed orange peel, peat (of course), roasted pistachios, roasted plantains, earthy notes, green herbs and iodine at the finish. Talk about a flavorful journey. 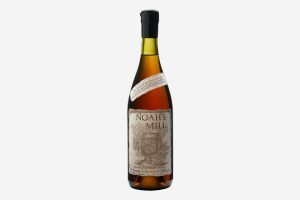 Breaking into what we consider the higher-end tier of camping whiskey, Noah’s Mill is definitely more of a sip n’ savor campsite spirit. That’s because such effort goes into this small batch bourbon consisting of varied whiskeys between 4 and 20 years old. It’s all handmade in the hills of Kentucky bourbon country and is incredibly well-balanced, smooth, and enjoyable neat or with a few drops of distilled water. Pair with some good-looking folks, great stories, and a bit of in-the-moment relaxation for best results. What better way to enjoy that personal campfire than with a little brimstone. 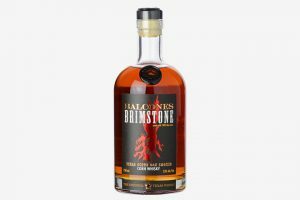 Straight from the Texas distillery Balcones, their Brimstone whiskey is a smokey corn spirit that’s uniquely smoked rather than the grain itself – serving as a spearheading trend in the American whiskey movement. What results is a nose full of roasted barbecue notes, a peppery palate with herbal undertones and BBQ sauce, and a finish that alludes to a pepper-rubbed steak cooked over charcoal. Yes, you read that correctly.